Introductory first-level adventures are a hard genre to work in, because the fragility of starting characters means every hazardous encounter may be a character’s last, while a PC death may only be the party’s first. Perhaps for this reason, most intro adventures tend to follow patterns which make them very predictable: small humanoid lairs, static ruins with lots of abandoned storerooms, save-the-village quests. I have seen few attempts to break with the formulas established in Keep on the Borderlands, In Search of the Unknown, and The Village of Hommlet. The Maze of Nuromen happens to be based on the basic concept of In Search of the Unknown (with a hint of The Tower of Zenopus), the abandoned lair dungeon, which I suppose is logical considering it is written for BLUEHOLME™, a Holmes D&D clone. There is a very promising outer charm to this (free) product: cartography, layout and the presentation of information all have a simple elegance which make the contents accessible, and the package attractive. Particularly notable are the wondrous public domain-sourced illustrations by Harry Clarke, whose decadent art nouveau pictures suggest a strange fairyland atmosphere, and which were the reason I downloaded and read this adventure. Unfortunately, The Maze of Nuromen does not rise above a competent but average B1-inspired starter dungeon, and Clarke’s influence is not in particular evidence. Although the backstory has a high fantasy element that sounds interesting, what we have in the room descriptions are the same old armouries with corroded weapons, kitchen with discarded pots and pans, and barrack rooms with beds and a bunch of skeletonised guys still sitting around a card table (a low level dungeon encounter if there ever was one) – content which is elementary, mostly mundane, and lacking in potential for varied interaction. Of course, Nuromen is presented as a beginner’s adventure, so it should theoretically be all new and wondrous to new gamers. There are two issues I would take with this line of reasoning: first, the realities of gaming are, very few beginners will start with the BLUEHOLME™ rules. Second, there is no reason why a beginner’s module should not have more of the good stuff – stuff that is fantastic, strange and unexpected. These elements are few and far between in this module, and although there are some inventive undead encounters – like with a phantom of a drunkard, or a nasty surprise packed in an iron maiden – they scarcely detract from otherwise routine dungeoneering. What if there was more of the illustrations’ essence in the gameplay? What if those elementary ideas were twisted around a bit, or used in an extraordinarily interesting way? What if there was a dynamic element, perhaps related to the backstory (which is an adventure hook, but not a strong, active part of the action)? 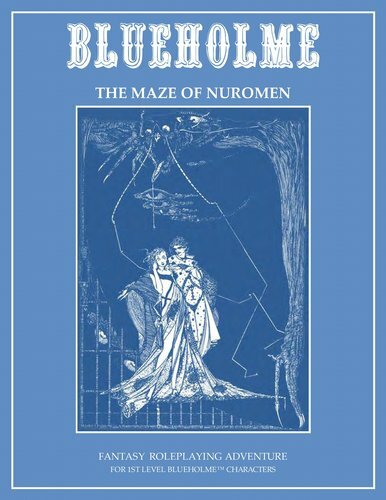 In summary, my problem with The Maze of Nuromen is not with the product per se, since it is a functional, playable meat-and-potatoes dungeon for first level PCs, and even gives off that elusive Holmes atmosphere if this matters. Rather, it is missing its own voice: it is one Holmes-inspired low-level dungeon among many, reusing the same ideas in a different combination. Get this one, get another, or cut up your own copy of B1 and rearrange the pieces: they will all be very similar. Dare we ask for more? Maybe not. If there is a lesson here, it is that sometimes that fancy artwork does not constitute a promise to go in with a certain set of expectations: it is often just artwork that happens to be very, very good.